is that entry 'VF-3: SVA-155' is that a error? It's what the book says. (instructions are in the second post). Note the funky Engrish version on the box and the errors in the Japanese YF-19 data in the instructions. I was going to post a linky to the MW archives on the kit... but, it's not there! Over the past few months, I haven't spent much time on translations - been too busy wading through conversions and updates to the RPG stats. 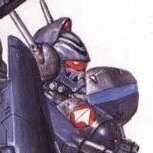 I've finished the 8 Macross Chronicle pages on civilian vehicles, but I haven't made them available, as I figure out the long term plan for the translations themselves. M7, M7D and MF are coming soon. 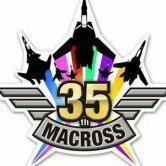 Alrighty... haven't been able to find the time to work on any more translations (kids on summer vacation, 35+℃, almost flooding of the house, et al), but I have been able to partially wrap my head around the "1 ship is really 5 ships" Macross Quarter concept. 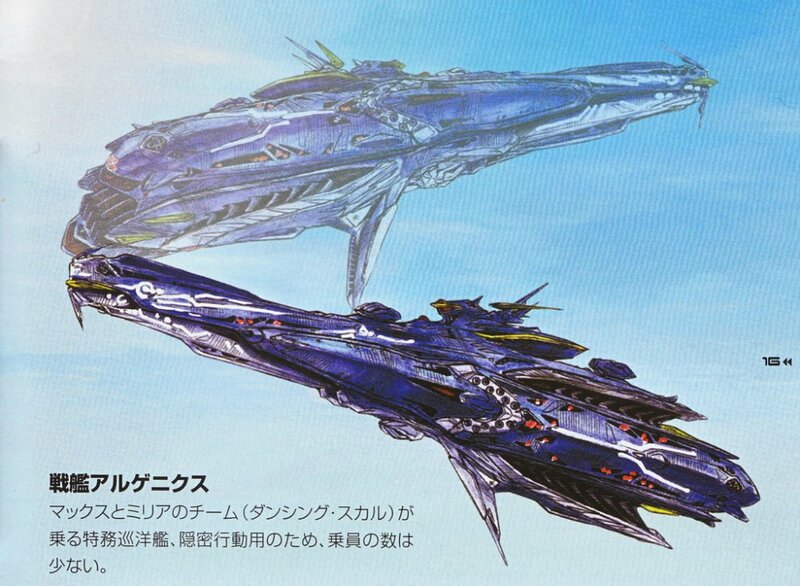 * Don't have a clear idea of the area where the Macross Quarter grabs/connects to these ships looks like, so they've been airbrushed into deep shadow. I imagine there's some kind of pistol or rifle grip along with the usual hard-dock connections. I've also got scans of the Stealth Cruiser (TV series), and the Vajra Destroyer, Battleship, New Heavy Vajra (all from the 2nd movie) and Hound Vajra (1st movie) waiting in the wings. I'm quite impressed by the results, as I not only got a half decent image out of a 50% transparent background image, I also managed to play with the tones, etc. to get a matching purple hue out of the blue that the recovered image was (it must've been flying really quickly toward the viewer). Attaching the original for comparison. Stealth Cruiser (images) coming soon! Where was this from again? (Before anyone says, "It's a ship so nice, they named it twice", the first "Stealth Cruiser" is generally written in katakana (giving the impression that that is the actual or common name of this type of ship), and the second "Space Cruiser" is generally written in kanji (giving the impression that that is the function or description of this type of ship). ... except one cool factoid: the Battleship Type is composed of multiple Vajra! A month ago, as I started on the Vajra stats, I realized that I needed all the available information on the Vajra. So, I've been translating content ever since. That includes content from "Official Complete Book Theatrical Macross F Wings of Goodbye", "Perfect Triangle Theatrical Macross F Official Guidebook", "Theatrical Macross Frontier The False Princess Roman Album", and all of Macross Chronicle's: Mechanic: ETC 01A: Vajra, and Worldguide: 08A & 08B: Vajra. The one main observation from this month long Vajra-athon is that there appears to be a significant difference on how the Vajra are treated in the TV series and movie incarnations: in the TV series, the Vajra ARE a resource, in the movie, the Vajra are COMPETITORS for resources. Though, that's probably more down to the movies clarifying ideas on the Vajra that the TV series created on the fly. Anyhow, enjoy the Glossary translations. I really like the neat touches, such as the "Fold Sale" and the occasional references between the series (E.g. MF's Temjin using a Neo-Guraaji (from M+ GE)). Note: in translating, I opted for the term bio-armaments to differentiate from the common English definition of bio-weapons. I personally don't like bio-armaments (it feels clunky), but it's to emphasize that they are biological guns, missiles, etc. (armaments), and not chemical nor bacteria-based weapons. A motherload of information, especially on the YF-29, VF-27 Super Parts, and the variant Macross Quarters. Alas, the stuff on the Vajra, though enlightening on how their portrayal in the film and TV series differs, ultimately doesn't have that much in detail. To quote the immortal Fizzick, "...I do not think it means what you think it means"
Not really. It's a buzz word. Although most are stealthy (especially compared to the alien ships), there are some that aren't stealthy at all. You're welcome to your own opinion. One man's freedom fighter is another man's terrorist. The main point is that neither (in the case of Macross), are the "Anti UN" and no such organization exists in Macross. I've also caught up on the backlog built up over the past half a year. Yay! Sketchley, Is Gamlin still in the military? Is he still a pilot? You mention his title 'Director Gamlin', Director of what? Can you elaborate please? Gamlin's only ever depicted in a suit, and during combat, he's usually behind the scenes or on the sidelines. His title is director, and I don't believe he's ever referred to by a military rank in the serial; which implies that he's no longer a soldier. But I'm tempted to say that he's a civilian contractor working for the military, or at least the government, of Macross 7. He's the director of the reborn Sound Force. In his later appearances, he's, for lack of a better term, the controller of Sound Force (in the sense of command and control). He and Max have a good working relationship in the series, and they are in direct communication with each other numerous times during the battles. Who were the UN Forces fighting against in Zero then? The Unified Forces (統合軍) where fighting against the Anti-Unification Alliance (反統合同盟). Though it's thin on specific details, it's a handy overview, and provides some new insight (the YF-19 -> VF-19 changes comes first to mind). At least the Northhampton class in the movie had less offensive mounted guns, but it still annoys me, that in 50 years, humanity still hasn't adopted the Zentradi omni-directional turrents. The most ideal mounted weaponry for space combat. Apparently there's a new model of EX-Gear introduced around the start of the 2060's (EDIT: in the unofficial setting version, that is). If there are any problems with links, etc., please inform me herein or by PM. Thanks! * I haven't uploaded the RPG stats, as I'm in the process of cleaving the two branches of the site from each other. I should probably get around to revising the Locations information - as there are reams of new stuff available with all the Macross Chronicle translations I've been doing. But I'm too busy with that! Another year, and another host. Well, the same one. New account. We'll see how long it lasts. - regular readers will note that the variants and armaments are only tweaked from the previous release. That said, I've also added the titles and first lines for all of the squadron markings that appear in the book, as well as some other odds and ends (ie: what the acronym DACT stands for - annoying that they don't print it on the same page that it first appears on!). Thank God. I was about to PM you and ask if you needed money. Thanks for breaking my bookmarks!